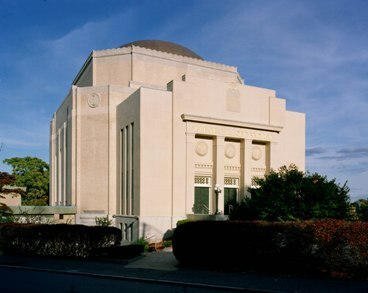 Temple Emanu-El came into being in 1924 when a small group ofinfluential Jewish leaders in Providence met to address the inability of the older Orthodox congregations to attract and hold younger Jewish adults in the modern American milieu. The new synagogue was to be a vibrant Conservative congregation from its inception, an idea supported by leaders from the Jewish Theological Seminary in New York. The idea caught hold immediately. Part of the Botanical Gardens of Brown University was purchased as a building site, and construction of a magnificent domed sanctuary was completed in 1927. The congregation grew steadily over the next decades, and soon became one of the leading synagogues in New England. A new school building was completed in 1953 accommodating the rapidly-expanding Religious School, and containing a large second sanctuary. And a second major construction project, the addition of a wing with function halls for social events, celebrations, and large-scale programs, was completed in 1959. Temple Emanu-El has always occupied a prominent place in Rhode Island life, and in the life of the national Jewish community. Two of its rabbis, Israel Goldman and Eli Bohnen, served as president of the Rabbinical Assembly, one of its cantors, Ivan Perlman, served as president of the Cantors Assembly, one of its former Executive Directors, Robert Hill, served as president of the North American Association of Synagogue Executives, and many Rhode Island leaders have been and are members of the congregation. The community continues its deep commitment to innovative programming and to offering an unqualified welcome to all Jews, regardless of background, training, or circumstance, who want to be a part of this community of faith. Temple Emanu-El, a traditional, egalitarian congregation affiliated with the United Synagogue of Conservative Judaism, is dedicated to cultivating, developing and sustaining Judaism and Jewish living in consonance with the ideals and standards of the Conservative Movement. The Temple seeks to encourage and stimulate higher levels of knowledge, ethical practice and ritual observance among our members, and to transmit these traditions to the next generation. Within our supportive community, we strive to foster meaningful worship experiences and a sense of being connected to God. The synagogue provides a welcoming environment which values feelings of kinship, a sense of belonging, and spiritual enrichment both in daily living and times of transition. We are committed to life-long learning: the performance of mitzvot; support for the local Jewish community, the State of Israel and Jews around the world; outreach to the unaffiliated; and dialogue and understanding among Jews, as well as between Jews and our neighbors. Through religious, educational, cultural, service and social opportunities, we endeavor to meet the needs of our diverse, thriving community of Jews. Education: Educate our members to live Jewishly by studying and performing mitzvot, and we support them in their efforts. Worship: Offer diverse opportunities for meaningful worship and connections to God. Continuity: Transmit Judaism and Jewish values from generation to generation. Community: Create a supportive, interdependent community and a warm, welcoming environment. Individual Needs: Meet the individual needs of our members and recognize the diversity of our membership. We encourage members to develop closer connections to the Temple and to strengthen the Congregation and the broader community through participation, volunteerism, and financial support.